Excent screen protector but limits the functions on the Mate Pro 20. Knuckle gestures do not work and finger print reconition struggles. If you can live without these functions then it is excellent, I could not. 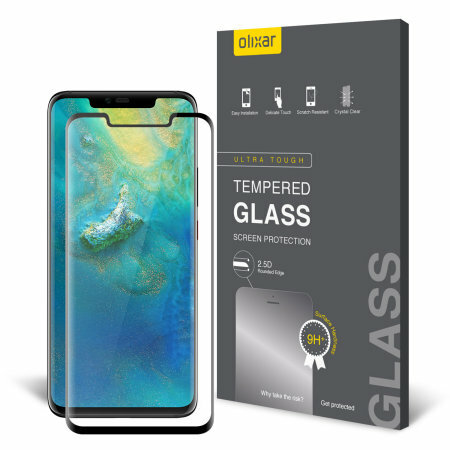 The Olixar Mate 20 Pro Full Cover Tempered Glass Screen Protector is easy to fit to your phone and fit's the device perfectly (watch the video if unsure). Also, it has a crystal clear and easy to keep clean. I used mine with the UAG custom case which was designed for the phone which was recommended not the cheapest but no issues with this cover. I was told some of the Chinese cases from places like eBay might not fit quite as well. Who knows? The only downside is that the fingerprint recognition does not seem to be as effective a before I fitted it. I actually use either face recognition and the old fashioned password so isn't a major bother to me but might annoy some people. All in all, it looks great does the job or at least it seems to but I am not dropping my phone to find out. It's crystal clear and you would barely know it was there. It would get 5 stars if the fingerprint recognition worked better but guess that's a small price to pay for peace of mind. Would still recommend it to friends and family who have this phone. Utterly useless. It sticks to the phone only by a tiny adhesive stip on the protector's edges, thus creating a void between the protector and the screen surfaces. This means the original smoothness of the screen finger operation is no longer there as you have to press repeatedly at times to achieve the same result. Not to mention operating close to or on the edges, that becomes totally random to impossible. Very frustrating. And expensive. Stay away.money wasted. followed instructions via QR we link, stuck reasonably well for the first couple hours. Then the edges would stick properly. If it stuck down properly, that would have outweighed the altered touchscreen functionality. But it didn't. Won't be buying again. The fingerprint is not working and sensivity of the screen is very bad..u must hit the screen hard with the finger to be able to use it ..
Not fitting flush enough due to curve - hard key press required on edges. The glue only seems to be around the edge of the glass rather than across the entire screen. So there is a very small gap between screen and phone which, as it is for a touch screen phone, reduces how well your touch screen works. Doesn't fit well and lifts easily on the sides even with no cover on back. Very expensive for what it is, lasted 2 days before there was grit and stuff stuck under the edge. Lost screen sensitivity, plus it didn't seem to fit properly with the case I bought. Couldn't get it to stick very well. The more I used the phone the looser it got. Once it came off the phone I couldn't get it to stick back on again. The cover looks good and on first impression will fit well. However, the glue is only around the edge of the screen cover meaning it doesn't fit completely against the screen. This made it hard to type anything. Safe to say it wasn't on long! If you want protection and the ability to move the protector once applyed then YES!!! Easy to apply and looks like the real deal but did not fit comfortably with my case (northcase eiger) a pretty common case manufacturer. It took couple times to get it in place with the sticky tab guides. No instructions how to use it so had to YouTube "how to". Only two failed attempts meant a small part of the sticky tab lost its stick and I had to throw it away. The cleaning cloth left streakes, as opposed to clean streaks off. The only good part of this screen prote tor was the alcahol wipe. It is good but has a few querks???? It will not work together with the Olixar Mate 20 Pro GEL case. It broke after four days. The item I believe isn't very fit for Purpose. The screen protector broke after four days and this certainly didn't have any drops etc as its a brand new phone and I have been very careful. The screen protector also doesn't allow the finger print scanner to work either.